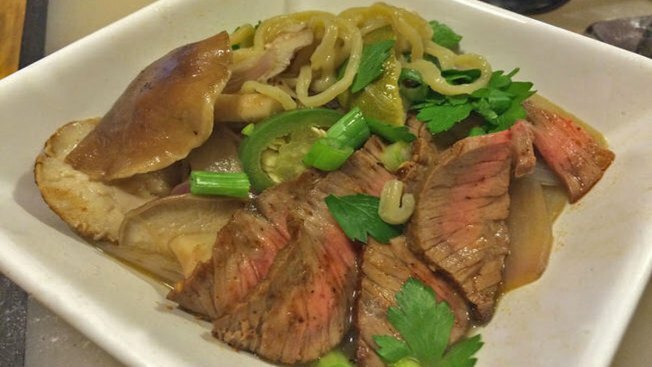 Make ramen noodles from scratch and top them with a little Texas spice. Ramen noodles have come a long way from the packaged versions I enjoyed back in my college days. Since those versions contain quite a bit of sodium, I researched the basic ramen noodle to see if I could make my own from scratch. The key ingredient is kansui, a liquid product that is potassium bicarbonate and sodium bicarbonate. This gives the noodles that familiar texture and elasticity that is different from regular pasta noodles. Kansui is available in most asian markets or online. Once i had the basic noodle, creating an interesting topping was the fun part. This “Texas Beef Broil” combines beef with barbecue sauce, soy, cayenne peppers and shiitake mushrooms. It’s a big burst of flavors. Combine dry ingredients in a large bowl. Pour kansui into water and then pour both into flour mixture. Work the dough until it comes together. Roll it onto a lightly floured work surface and knead it for about 5 minutes, incorporating a bit more flour. Wrap dough in plastic and let it rest for 1 hour at room temperature. After dough has rested, work with 1/2 at a time, keeping the remainder wrapped in plastic. Using a pasta maker, flatten dough to about 3 settings shy of the thinnest setting. Then using the noodle attachment, run the dough through to create your noodles. Place them on a work surface and toss them with a bit of the flour/cornstarch mixture so they don’t stick together. Set aside. Bring a pot of water to a boil for the ramen. Preheat your broiler. Put salt, pepper, chili powder and garlic on a work surface and chopped ingredients together with a sharp knife. Spread mixture on both sides of the top round. Broil for 6 minutes per side for rare. Broilers vary greatly by oven, so you may have to adjust this time. Mix together barbecue sauce and soy sauce. Remove top round from broiler and brush with a thin layer of the barbecue sauce mixture. Reserve the remaining sauce. Cover beef with aluminum and set aside. Heat sesame oil and olive oil in a large saucepan over medium heat. Add onions and mushrooms and toss until just tender, about 3 minutes. Add serranos and toss for 1 minute. Add thin lime slices, carrot curls, chicken stock and remaining barbecue sauce, increase heat to high, and bring mixture just to a boil. Add parsley and taste for seasoning. Meanwhile, boil ramen for 2-3 minutes. Drain and divide among 4 serving bowls. Divide sautéed vegetables and the stock mixture among 4 bowls. Arrange carrots, peppers and mushrooms on top. Thinly slice steak and divide among bowls. Sprinkle with toasted sesame and scallions. Garnish with half of a soft boiled egg and lime slices. *To make soft boiled eggs, place eggs in a pot with room temperature water. Bring to a boil over hight heat. Once pot reaches a boil, remove from heat and cover for exactly 6 minutes. Drain and run cold water over eggs to stop the cooking process. Peel and slice. Use one half with each serving.